Education: Studied Chinese at Shaoxing Teacher’s College. Also holds a Masters degree in Law. Career: Mostly in Zhejiang Province where he worked alongside Xi Jinping for over 4 years. 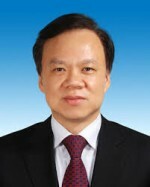 Promoted to Party Secretary of Chongqing in July 2017. Prospects: Eligible to join the Politburo in 2 years. Described as a confidant of Xi Jinping. Relevance to Tibet: None directly, but considered a possible 6th generation leader. A full member of the 18th Central Committee of the Communist Party of China, promoted to Party Secretary of Guizhou Province (from Governor) in 2015, and in July 2017 to Party Secretary of Chongqing – a role, according to the Financial Times, as a near guarantee for Politburo membership – displacing fellow 6th generation front-runner Sun Zhengcai. The majority of Chen’s career, since he joined the CPC in 1982, was in Zhejiang Province, making him a member of the “Zhejiang clique” or “New Zhejiang Army” and, according to The Diplomat “Is this Man China’s Next Leader?”, is the first of that clique to emerge as a 6th generation leader. Chen held a number of roles at county level in Zhejiang Province; rising through the ranks to become Party Secretary of Shaozing in 1991 and deputy Party Secretary of Ningbo in 1999. He spent a period working on Propaganda: as chief editor of Zhejiang Daily and as Propaganda Chief of Zhejiang. Chen was transferred to Guizhou in January 2012. He served as Governor of Guizhou from January 2013 – July 2015, at which time he was promoted to Party Secretary, becoming only the third provincial party-level chief born after the year 1960 (the other two, promoted previously, being Hu Chunhua and Sun Zhengcai). Chen seems very likely to join the Politburo in 2017.